Daily Fragrance: L’Artisan Parfumeur Bois Farine, for the weekly Now Smell This community project. 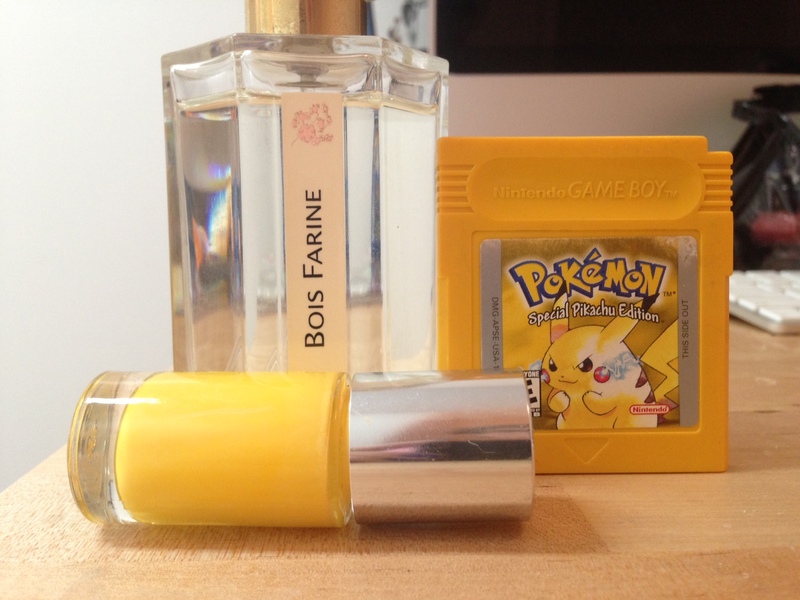 You’re supposed to wear a Hermes fragrance or a Jean-Claude Ellena creation, so I went with the enchantingly creative Bois Farine. Bois Farine was famously inspired by the Ruizia Cordata tree, whose branches smell like flour. But to me, Bois Farine has always smelled like peanut butter. My brother is allergic to peanuts, so Bois Farine is basically my personal forbidden fruit. I will never forgive L’Artisan if they discontinue this. Daily Nail: Clinique 70 & Sunny. This manicure may have been inspired by the Pokemon Yellow cartridge. Perfect egg yolk color, typical yellow polish streakiness. All Lacquered Up just posted her top yellow polishes; I think I might need OPI I Just Can’t Cope-acabana. Daily Game: Pokemon Yellow. Please join me in a moment of silence for my beloved Nintendo 3DS, which left our cruel world on Wednesday after extensive water damage. You were a good, brave 3DS. May you frolic with Mario, Link, and Pikachu in the Nintendo Elysian Fields. In the absence of my trusty companion, I’ve been kicking it majorly old-school with my old Gameboy Color and Pokemon Yellow. As much as I’m enjoying those 1999 graphics, I’ve decided to save up for a replacement 3DS (although the original can never be replaced in my heart) by selling off a few perfumes. I have the discontinued Comptoir Sud Pacifique Vanille Mokha and the upcoming Josie Natori perfume, both 50 ml and never opened. Please note that this is a different bottle of Vanille Mokha than the very-much-opened bottle seen in yesterday’s Dailies. Please email me if you’re interested in either! Please feel free to share your own dailies (and to use your own categories) with us! Disclaimer: This post does not contain affiliate links. All products listed in this post are my own purchases, much to my wallet’s dismay. I was wearing Jour d’Hermes but it’s already pretty much worn off, so I put on some Moschino Funny to keep with the grapefruit theme. LOVE this one. I missed Moschino Funny, and Cheap and Chic. 😦 Moschino seems like one of the few lines with a sense of humor about their perfumes. I’ve been wondering how those scented Revlon polishes perform! If only all nail polishes smelled like violets and grass. I think yellow polishes look great on other people but on my skin they are ghastly. Gold is okay but not yellow. This is how I feel about red polish. Have yet to find a red lipstick that doesn’t make me look like Queen Amidala, either. So. SOTD was my only Hermes, Kelly Caleche EdP. I don’t like the EdT, it’s too vetivery and celery like, but the EdP is lovely citrus-rose-soft leather. Are you kidding? I cry TODAY when I see Spock’s funeral. I’m getting cynical in my old age; it’s harder to make me cry these days. But if I reread Outlander I always cry at the end. That’s exactly how I feel about Osmanthus Yunnan, too. But it’s so damn pretty and happy that I’ll probably end up getting at least a 15 ml someday. The dog visit sounds really frustrating. Are y’all pretty far out from a shelter? I had a great experience at the Charlottesville ASPCA, but that must be at least 2 hours from you. Keep us updated on the beagles and lab! There’s a shelter in town, and another one about 20 minutes away, but they don’t happen to have any dogs at the moment that fit our requirements. Petfinder is actually just sort of a clearinghouse databank for rescue ops/shelters/pounds to list the animals they have available for adoption, so I’ve been able to access the lists of all the shelters in surrounding counties. I didn’t think we were being that picky, but apparently we are. Oh well. Osmanthe Yunnan is indeed pretty and happy. Here in Oz it has been your birthday already for hours, we are celebrating like crazy. Frag Aromatics Elixir Perfumers Reserve. Nails still deep purple with multicoloured glitter sparkles. Game still Frozen. Thank you so much, Portia! 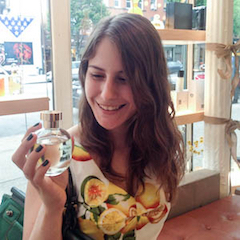 😀 Nice job on snatching up that Perfumer’s Reserve!